To observe it objectively from above. To observe what was actually happening. To observe where the event stood in the great scheme of things and therefore see things in perspective. People who experience this feeling often have a certain perspective on life. They tend to be positive, yet also realistic. They appreciate what they have got, rather worry about what they haven’t got. Al Siebert, who studied survivors, said that such people balance what appear to be paradoxes. They can be deeply serious, but also playful. They are in touch with their feelings, yet able to see themselves from outside. They are deeply intuitive, yet able to gather objective data to make good decisions. Looking at events in my own life, I found it useful to remember Al’s work one night when attending an Accident and Emergency Unit. During the day a catheter had been removed and I had happily continued with my work in London. Unfortunately I then developed urinary retention, which led to increasing pain. Taking myself to A&E, it took several hours before treatment was available. 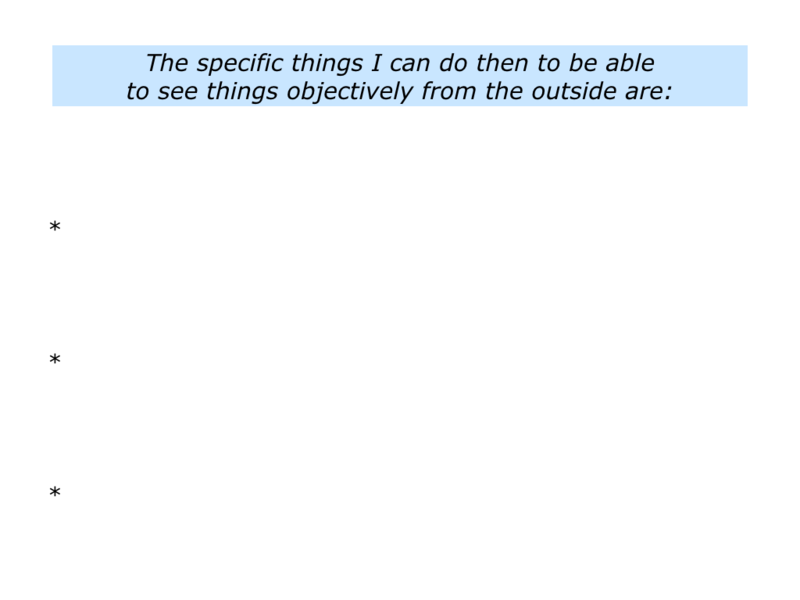 You will, of course, have your own way of seeing events from the outside. If you wish, try tackling the exercise on this theme. This invites you to look back on your life and do the following things. Describe a specific situation when you were able to hover above an event involving yourself and see it objectively from the outside. 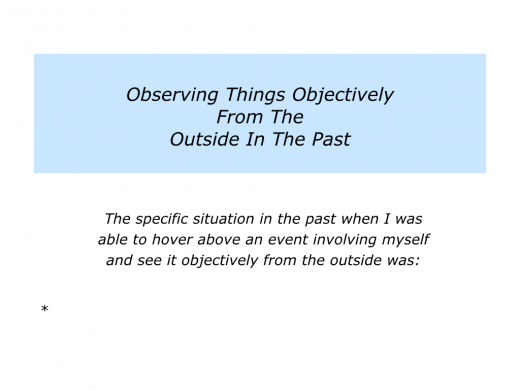 Describe the specific things you did then to see the event objectively from the outside. 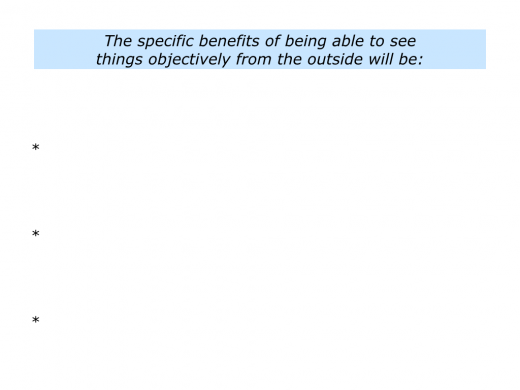 Describe the specific benefits of being able to see the event objectively from the outside. 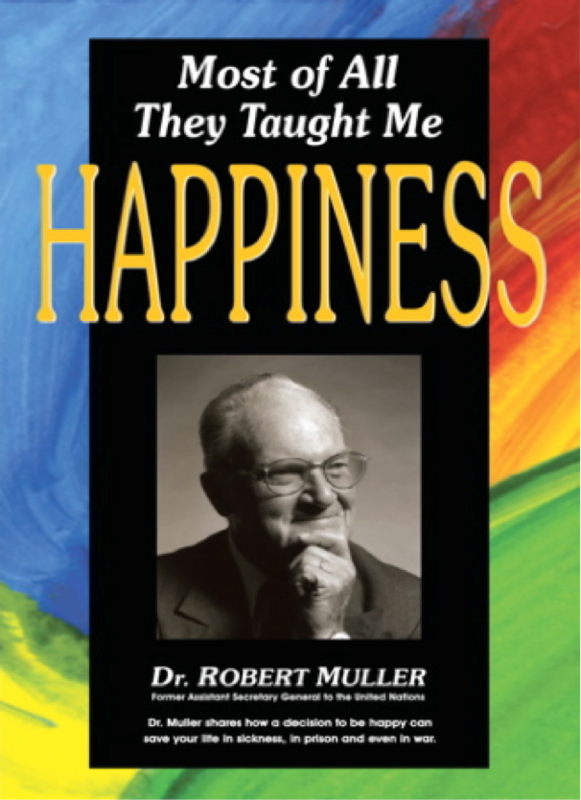 Robert Muller, an Assistant General Secretary of the United Nations, often reframed challenging situations. One of his books is called A Planet of Hope. Looking back on his life, Robert described a key event that occurred when he was hunted by the Nazis. One day he found himself trapped in a building by a search party. Being a great follower of adventure films, he decided to reframe the situation as a film. He was a twenty-year-old being pursued by the Gestapo. Robert recalled what he had learned about auto-suggestion from the French psychologist Émile Coué. He needed to feel calm and creative. Looking at himself as if in a film, he became more detached. The challenging situation was a test of his ingenuity. Wouldn’t it be great, he thought, to make a thrilling escape? Robert felt fully alive and alert. Scanning the options, he found a way to emerge safely. He escaped the Nazis and went on to help many people in his life. Immediately, I return to a positive, creative mood. This mysterious quantum change between a negative and a positive current is a mystery to me. I do not understand it. But it has done miracles for me. To be unhappy, to be ungrateful, not to feel wonder and appreciation for the incredible gift of life is a most foolish and short sighted attitude. The toughest prison of all is that which man imposes upon himself. Looking back, Robert says he learned much from his parents and grandfather. Writing in Most Of All, They Taught Me Happiness, he talks about how his grandfather taught him to count his blessings. 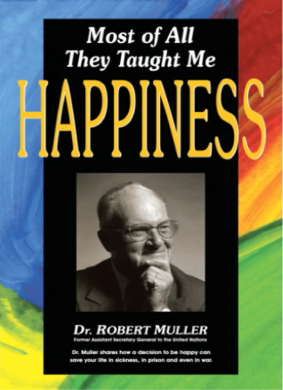 Through his stories he transmitted to me the wisdom he had acquired in his life. 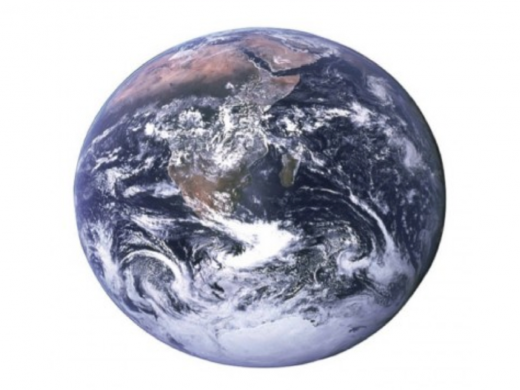 “Think of them and be grateful for the wonderful world you can see: the flowers, the animals, the sunshine, the stars, the brooks, and the meadows. “When your mother kisses you, think of those who have no mother. When you look at my grey hair, think of the beauty of youth. Let’s return to your own life and work. 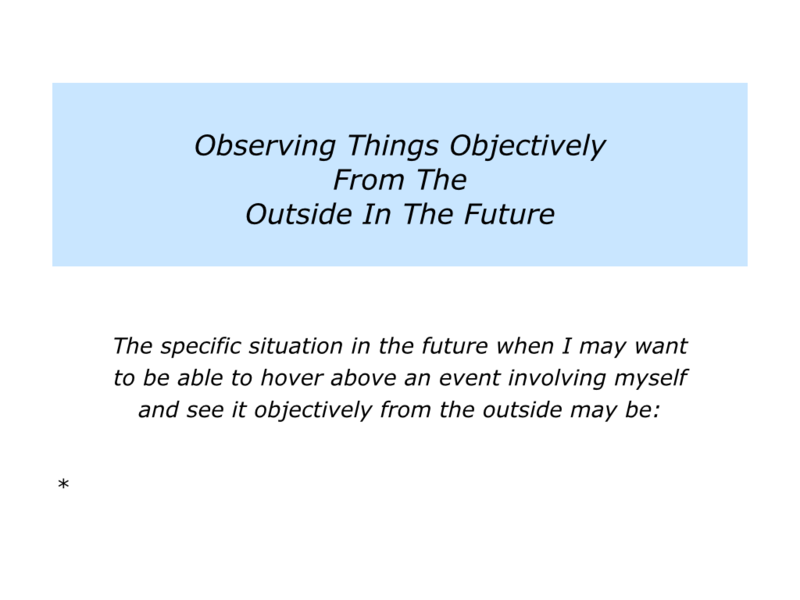 Looking ahead, can you think of any possible events when it may be useful to hover overhead and view things from the outside? You may want to manage a potential crisis, tackle a difficult challenge or simply deal with the processes of life. How would you like to behave in that particular situation? 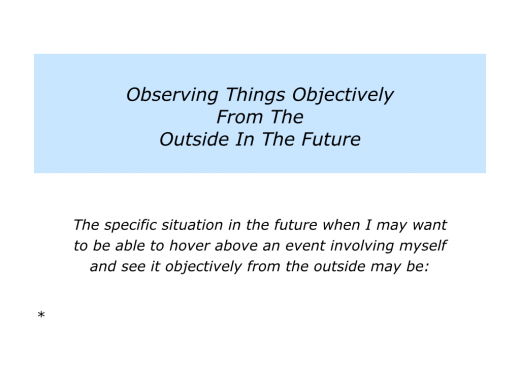 Describe a specific situation when you may want to be able to hover above an event involving yourself and see it objectively from the outside. 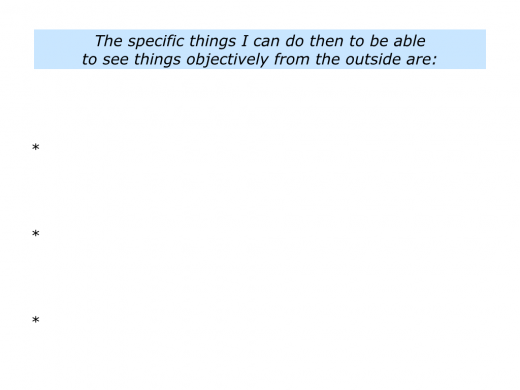 Describe the specific things you can do then to see the event objectively from the outside.